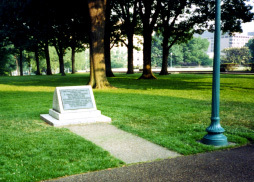 The site of the Washington, D.C. house of Charles Wilkes. Episode: 5. Site Number: 045. Date Posted: 27 April 1996. Location: Washington, DC, USA. Type: Memorial. I had been told that there was a marker or plaque of some sort relating to Lt. Charles Wilkes in Washington, D.C., somewhere between the Capitol and Union Station. During two trips there I searched on foot and by car and could find nothing. I enquired of the Library of Congress, the National Archives, the Parks Department, the Smithsonian, the Office of Public Buildings & Grounds, the Commission of Fine Arts, etc., and consulted the published guides to public art and memorials, all to no avail. But on my third reconnaissance I found it! Although small in size there it was close by to a major walkway linking (as I had been told) the Capitol and Union Station. 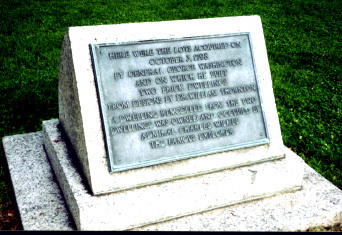 What I found was a bronze tablet (32" x 24" and mounted on a granite base) that reads: "Here were the lots acquired on October 3, 1798, by General George Washington and on which he built two brick dwellings from designs by Dr. William Thornton. A dwelling remodeled from the two dwellings was owned and occupied by Admiral Charles Wilkes the famous explorer." There's no indication as to when or by whom it was erected. Wilkes (1798-1877), as a Lieutenant, was given in 1838 the command of the U.S. Exploring Expedition, the country's first official expedition to include Antarctica. Wilkes arrived in Antarctic waters on January 10th, 1840. Eleven days later he encountered the French explorer Dumont d'Urville. During his expedition he experienced a few personnel problems: 62 men were discharged as unsuitable, 42 deserted, and 15 died!